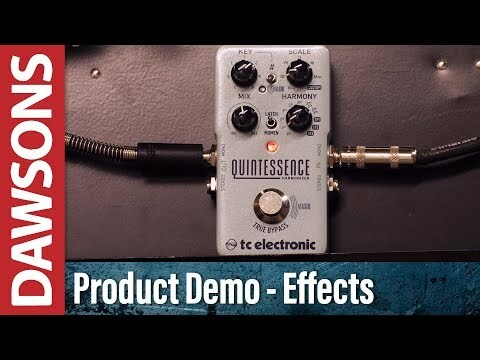 The TC Electronic Quintessence Harmonizer Guitar Effects Pedal is perfect for those who want a fuss-free way to lay down some heavenly harmonized licks. Whether you're a fan of classic rock or heavy metal, from Thin Lizzy to Judas Priest, we all love a sweetly executed harmonized solo. Now you can do it without having to rely on someone else keeping up with you! Set across a wide selection of modes and scales, you'll have endless enjoyment in exploring and expanding your tonal arsenal. As we've come to expect from the team at TC Electronic, the Quintessence Harmonizer Guitar is a little beauty not just in how it sounds, but also how it looks. The layout is intuitive and even those who don't know a thing about theory will be up and running in no time. Across the top of the pedal you'll find knobs for Key, Scale, Harmony, and Mix, as well as switches for Sharps (#), the Latch/Momentary switch, and TC Electronic's baby, the MASH footswitch. The Key knob does exactly what you'd expect, and allows you to dial in the Key you wish to play, with adjustment coming from the #-Switch, which in turn pitches the key up a semitone across the entire fretboard. The Scale knob offers up seven diatonic modes to harmonize with, as well as a Custom mode that can be edited using TC's TonePrint mode on the Harmony knob. The Harmony knob has six settings that add a single voiced harmony to your dry signal, two settings that add 2 voices, and then three setting where you can get the TonePrint Editor involved again, and a whole universe of endless possibilities is opened to you. The Latch/Momentary switch enables you to decide if the footswitch acts like a normal switch (Latch mode), in that you need to hit it on and then hit it again to switch it off, or whether the pedal is only active when your foot is on the switch (Momentary mode). The Mix knob adjusts the mix between your dry signal, and the effect-laden signal. The MASH footswitch gives you greater dexterity and dynamic control in highly expressive tool, without having to integrate additional gear or compromise on pedalboard space. Thanks to MASH, the footswitch is pressure-sensitive and reacts to how hard you lean on the switch, responding just as an expression pedal would, in both Latch and Momentary mode. The default setting will automatically bend your harmonized note up to the next interval in the scale, but you can assign MASH to control pretty much any parameter you wish. The MASHlight indicates how intense the effect is, with it getting brighter as you increase pressure on the switch. TC Electronic's "True to Tone" ethos means that the Quintessence is equipped with a True Bypass or Buffered Bypass switch, and a Kill-Dry on/off, so that the pedal guarantees pristine tonal integrity without loss of tone. Whether the pedal is on or off, your dry tone retains its integrity in all its glory thanks to Analog-Dry-Through. By now I think we are all aware of TC Electronic's awesome TonePrint tech, but for the uninitiated, here is a brief overview. TC's TonePrint editor allows you to dive deep into the world of patch editing, and enables you to create your own TonePrint's from scratch. In the case of the Quintessence, you can create your own custom scales that will create some mind-bending harmonies. You can control effect behaviour, knob ranges, and everything in between. Alternatively, you can select one of TC Electronic's many TonePrints that have been created by some of the world's top artists.